It goes without saying that YouTube really makes our e-life wonderful, especially when it comes to video enjoyment on YouTube. However, YouTube videos can pose problems if Mac users intend to transfer YouTube videos to iTunes since iTunes cannot view YouTube FLV video but only responds to MP4, M4V and MOV formats. Consequently, it seems necessary to convert YouTube downloads to iTunes on Mac first. But users running on Mac platform usually suffer from the inability to get video conversion done with Freemake software as it is only in line with Windows platforms. In this case, it's better of searching for a robust YouTube to iTunes converter for Mac that can serve as a Freemake alternative for Mac and convert YouTube FLV/WMV/HEVC/3GP to iTunes on Mac computer well. MacX Video Converter Pro - Best YouTube 4K/HD to iTunes downloader to download and convert YouTube SD/HD/4K UHD videos to iTunes MP4 MOV M4V on Mac (Mojave supported) for iPhone iPad iPod and Apple TV. 1. iTunes offers audios and videos at high quality at the cost of fees. The quality is better than that on YouTube that is often uploaded by users. 2. A music video on YouTube are large in size. But when it comes to iTunes, the songs on iTunes are in MP3 format, which consume less disk space. 3. Compared with YouTube, iTunes functions transferring files to iOS device, while YouTube neither have any portable media player or transfer youtube files to deices. 1. YouTube is accessible to any people. And contents on YouTube are various, ranging from movies, music videos, TV shows, game videos, tutorial videos, etc, some of which may not on iTunes. So iTune users may need to convert YouTube videos to iTunes format so as to enjoy more contents. 2. YouTube is free of charge while you have to pay a fee of generally $1.29 for a single and $14.99 for a movie on iTunes for enjoyment. By downloading YouTube videos and saving in iTunes, you don't have to spend a penny. 3. Videos and music on YouTube are unmanageable. By converting YouTube videos to iTunes format, these contents can be well organized, sorted, and even transferred to your iOS devices. See how to sync video from Mac to iPhone. 4. Some videos on YouTube can be suddenly deleted, but you can convert YouTube to iTunes as a backup to safe keep them. To put an end to the difficulty in transcoding YouTube clips to iTunes on macOS, you can simply rely on the well-received MacX Video Converter Pro which perfectly integrates the abilities to both download and save YouTube videos in iTunes on Mac. To be specific, you can directly transfer YouTube downloaded videos to iTunes on Mac without needing to download YouTube video beforehand. In addition to downloading and converting YouTube videos to iTunes on Mac OS X, you can feel free to convert among HD and SD videos like MKV to AVI, YouTube to MP4, AVI to MOV, WMV to FLV, etc on Mac and transfer any YouTube video to iPhone, iPad Air, iPad Mini Retina, iPod Touch, Samsung Galaxy S9, HTC One, etc without sacrificing video quality. Free download this YouTube to iTunes converter for Mac, load a video you've already downloaded from YouTube. Additionally, batch convert is supported. You can load more YouTube videso to be converted to iTunes. Optional: Download YouTube Videos - you don't even need to download the YouTube video file beforehand. This tool is bundled with a YouTube video downloader. 1. Click "YouTube" button to activate YouTube downloader tool. 3. Choose the YouTube video resolution, codec, file size and format, the rest video downloading job will be automatically done by this app. Since you need to transfer YouTube video to iTunes, here choose "to iTunes" button. Therefore, you may use this YouTube to iTunes converter to convert YouTube FLV video to iTunes, so that you can sync the YouTube video to iPhone iPad iPod and watch it anytime. Hit the "RUN" button and start converting YouTube videos to iTunes on Mac OS X. All the tasks can be finished at fast speed and high output quality. Note: this YouTube video converter for Mac enjoys free upgrade to support the latest Mac version-Mac OS X Mavericks. By the way, for Windows users, you can get MacX Video Converter Pro for Windows to suit your needs. 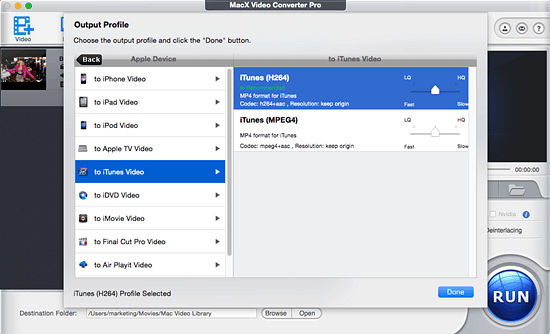 What video format does iTunes support most? This article will tell you the best video format for itunes. The tutorial is a step by step guide about converting video (YouTube video included) to iTunes on Mac for free, then you can transfer them to your iPad, iPhone, iPod etc for playback.